My roommates had a long standing joke about how I stuck to recipes, almost to a fault. They on the other hand were a bit more nilly-willy about their cooking. Well…progress has been made! I officially have a recipe I made my own. I found a recipe for Stacked Roasted Vegetable Enchiladas…I turned it into Mexican Lasagna. 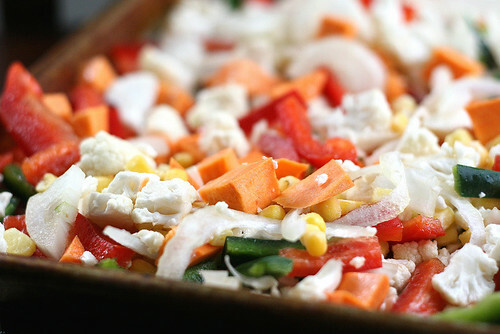 Place bell peppers, cauliflower, sweet potato, onion, and corn kernels onto cookie sheet. Drizzle olive oil and sprinkle the cumin and minced garlic over top. Add a generous pinch or two of salt and black pepper, then use your hands to mix everything together. After everything is coated well, spread the vegetables evenly in the pan. Roast for 30-40 minutes until vegetables are tender and begin to brown in spots. Stir or shake the pan every 10 minutes for even roasting. Remove pan from oven and reduce oven temperature to 350 degrees F.
Prepare a 9x9x2-inch square baking pan with a little olive oil. In a small bowl, stir the cilantro into the salsa. * Spread enough salsa to cover the bottom of the baking pan. Top with 1/3 of the vegetables. Layer on a handful of spinach…this is the noodle layer! Put on another layer of salsa, another 1/3 of the vegetables. Top with chicken and 1/2 of the cheese*. 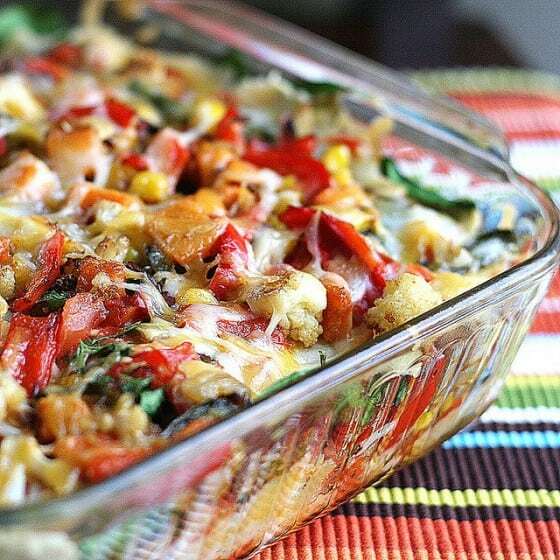 Make a second layer of spinach, salsa, veggies, and then cover with the rest of the cheese. Cover with aluminum foil. Bake for 20 minutes. Remove the foil and bake another 10 minutes, until cheese is melted and everything is heated through. Serve with sour cream and a sprinkle of sliced scallions. It goes well with tortilla chips or a tortilla, but I like it just as well without. *My dad gets heartburn from the skin on bell peppers. We just roasted the halves under the broiler on high for a couple minutes and the skin came off pretty easily. *I am notorious in my mother’s kitchen for making a ton of dishes when I cook so to save on dishes, I cheated and sprinkles the cilantro over the salsa. *My mom and I are both watching calories so I made half of this without cheese. That way we could measure how much we put on top. Without the cheese…a quarter of the recipe is about 290 calories. My mom told me after dinner that she wasn’t really sure about this recipe, but that it was really very good. So…before you shake your head at sweet potatoes and cauliflower in a Mexican dish…try it…it’s delicious.